In 1940, the Polish Underground wanted to know what was happening inside the recently opened Auschwitz concentration camp. Polish army officer Witold Pilecki volunteered to be arrested by the Germans and reported from inside the camp. His intelligence reports, smuggled out in 1941, were among the first eyewitness accounts of Auschwitz atrocities: the extermination of Soviet POWs, its function as a camp for Polish political prisoners, and the "final solution" for Jews. Pilecki received brutal treatment until he escaped in April 1943; soon after, he wrote a brief report. This book is the first English translation of a 1945 expanded version. In the foreword, Poland's chief rabbi states, "If heeded, Pilecki's early warnings might have changed the course of history." Pilecki's story was suppressed for half a century after his 1948 arrest by the Polish Communist regime as a "Western spy." He was executed and expunged from Polish history. Pilecki writes in staccato style but also interjects his observations on humankind's lack of progress: "We have strayed, my friends, we have strayed dreadfully... we are a whole level of hell worse than animals!" These remarkable revelations are amplified by 40 b&w photos, illus., and maps. Log In to track Captain Witold Pilecki on eReaderIQ. 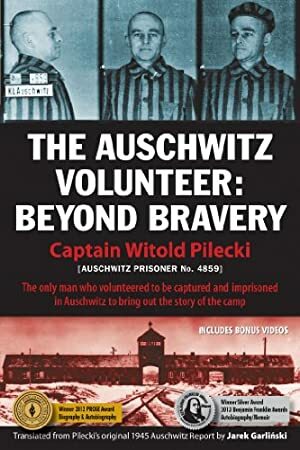 to be notified each time the price drops on any book by Captain Witold Pilecki. to stop tracking Captain Witold Pilecki. Log In to track Michael Schudrich on eReaderIQ. to be notified each time the price drops on any book by Michael Schudrich. to stop tracking Michael Schudrich. Log In to track Norman Davies on eReaderIQ. to be notified each time the price drops on any book by Norman Davies. to stop tracking Norman Davies. Log In to track Jarek Garlinski on eReaderIQ. to be notified each time the price drops on any book by Jarek Garlinski. to stop tracking Jarek Garlinski. We started tracking this book on May 13, 2014. The price of this book has changed 19 times in the past 1,808 days. The current price of this book is $11.99 last checked 11 hours ago. The lowest price to date was $9.99 last reached on May 13, 2014. The highest price to date was $15.99 last reached on February 3, 2018. This book has been $15.99 5 times since we started tracking it. We last verified the price of this book about 11 hours ago. At that time, the price was $11.99. This price is subject to change. The price displayed on the Amazon.com website at the time of purchase is the price you will pay for this book. Please confirm the price before making any purchases.